Born in Werchter, a small village in Belgium, Cornelius van Leemputten was a self-taught artist. 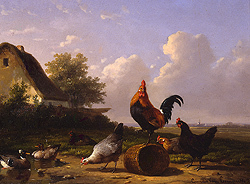 With the exception of a few lessons from his father Jan-Frans van Leemputten, he taught himself by making mostly studies from nature in areas such as Brabant and Campine, close to Antwerp. 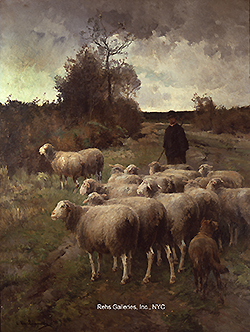 Van Leemputten became known for his scenes of farmyard animals, and especially for his landscapes with grazing sheep reflecting the influence of the French artist Charles Jacque (1813-1894). 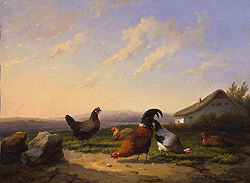 Barn Yard Scene (1864), Sheep (1871), and Flock of Sheep are typical examples of his work. 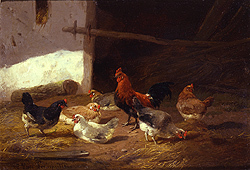 During his lifetime, van Leemputten regularly participated in international exhibitions and won several gold medals. His first was in Ghent in 1883, followed by others in Edinburgh in 1886, Port Adelaide in 1887, and finally Berlin in 1896. He was awarded the Chevalier de l’ordre de Leopold (Knight of the Order of Leopold) in 1895.